Aus einer Serie von Blumen-Röntgenaufnahmen von Brendan Fitzpatrick. Kann man auch als Prints kaufen. 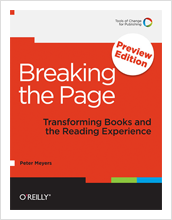 I'm thrilled to announce the release of the preview edition of "Breaking the Page: Transforming Books and the Reading Experience" (available through the iBookstore, Amazon and O'Reilly). In this free download, I tackle one big-ticket question: how do we make digital books as satisfying as their print predecessors? I've studied hundreds of recent publishing experiments, comparing them all to what I've learned during a 20-plus year career as writer, editor, and publisher. My goal: distill best-practice principles and spotlight model examples. I want to help authors understand how to use the digital canvas to convey their best ideas, and how to do so in a reader-friendly way. As app book tinkering flourishes, and as EPUB 3 emerges as an equally rich alternative, the time felt right for a look at the difference between what can and what should be done in digital book-land. That's my mission in "Breaking the Page." The preview edition's three chapters focus on some basics: browsing, searching, and navigating. This ain't the sexiest crew, I know, but it's amazing how hard it is to get this stuff right. I focus on examples good and bad, toss in a few design ideas of my own, and suggest how to include these services in a way that makes digital books pleasing on eyes, hands, and minds. What's the best way to integrate — and not just add — different media types? And, on a related note: is it possible to make the viewing experience as seamless and immersive as reading is in print? While I'm pushing ahead to the finish line, I'd love to hear what you think. Suggestions, examples, critiques … send 'em all my way. Green initiatives are prevalent throughout most industries these days, including publishing. But how sustainable are our publishing practices? Dennis Stovall, director of the publishing program at Portland State University and publisher at Ooligan Press, tackles this topic in the following interview. Stovall will also expand on his ideas at the upcoming miniTOC Portland in Portland, Ore.
How do you define "sustainable publishing?" Dennis Stovall: The two most important sustainability concerns are environmental and cultural. The former, which students at Ooligan Press address so well in "Rethinking Paper & Ink," gets most of our attention, and it fits with all of the issues of environmental care and sustainability. New production technologies afford some relief since overprinting of traditional books is reduced. But print on demand (POD) and short-run digital (SRD), while ostensibly helping to cut paper use, are probably more environmentally costly per book, and they are facilitating an incredible number of individual, new titles to be printed. The environmental impact of the manufacturing and rapid obsolescence of digital readers is often ignored, as if saving trees somehow offers consolation for other degradations, including the super exploitation of Third World labor. How many ebooks must be read on any single device before its real costs are less than the equivalent paper books? We fight for things like vegetable-based inks and more renewable fiber sources for paper books, but achieving that winds up pushing arable land out of food production. Yet the current mix of options, plus the demand for further greening of the processes, can reduce the carbon footprint for conscientious publishers today. Sustainable publishing, now, is about education, research, and best practices that both inform the production choices we make and provide the momentum for continual innovation and improvement. How sustainable are ebooks? Are they a dramatic improvement over print books or an incremental improvement? Dennis Stovall: Ebooks are sustainable, and in some form they're here to stay, but guessing their evolution over the next century is a lovely exercise in creative nonfiction. Ebooks are not a dramatic improvement over print; they are different than print. Every medium exists with constraints and opportunities, and the new frontiers of digital publishing have hardly been opened. Meanwhile, we've pushed many of the limits of the old technologies. That makes the "greener" pastures that much more inviting. We know neither the boundaries of this new territory, nor what realms we'll discover next. Of course, ebooks can do things that print books cannot. New forms are being experimented with, and old and new technologies are being mixed and matched to suit the needs of the material and the audience. We talk about the appropriate vessel for the content, but the vessels certainly affect the content. Not only are ebooks sustainable for now, they abet our efforts to sustain and create culture. The combination of digital persistence and massive data redundancy may be a better way to preserve literature and knowledge than paper, but there will just as probably be "books" that we prefer in the traditional form because of what that form can still do. So, it's different, not better — but the difference is good for literary culture. Which publishers are doing the most for sustainability? Dennis Stovall: Without giving grades, it's fair to say that indie publishers, in general, lead the way, frequently because these things have always been part of their mission statements. The newest generation of indies goes further, and they represent the future of the discussion and the actions to ameliorate the damage that we'll inevitably cause. Larger publishers are not ignoring the issues, but they're not leading. Still, shifting economic conditions, new means of production, and consumer demand are resulting in better, less environmentally costly decisions across the industry. What kinds of publishing are we — or should we be — sustaining? Dennis Stovall: There's all sorts of publishing I'd love to see disappear, but that's philosophical. In the hope of making a buck, we publish an extraordinary amount of worthless dross, wasting vast resources, and new technologies and new media aren't stanching the flow, but releasing it. Fortunately, we cannot say who gets to publish and what's allowed. So get over it — because this is also the upside. While we need to devise new, better filters — and that's what good publishers are, among other things — the liberating possibilities of new technologies have unleashed more literary experimentation than I can recall. The old ways of publishing, particularly following the literary homogenization brought by the superstores, have been a steadily tightening noose around the neck of literary culture. Writers suffered. Readers suffered. And independent publishing suffered. That's been reversed. It's wonderful.